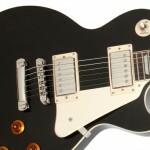 The Les Paul is the quintessential rock guitar played by some of rocks greatest guitarists. But what happens if you want a Les Paul but can’t quite afford the Gibson price tag. Step forward the Epiphone Les Paul Standard. Started in 1873 the Epiphone brand was a leading guitar manufacturer based in the US. They were in fact arch rivals of that other well known guitar manufacturer Gibson. For years the two companies would trade blows in the quest to be the top dog in the guitar world. The fierce rivalry between the two companies continued up until 1957 when the then head of Epiphone sold the entire company to Gibson for $20,000. Gibson then decided to continue the Epiphone name as a way of widening their dealer base. Rather than give Gibson guitars to untested dealers they would first test the distributor with the Epiphone range. 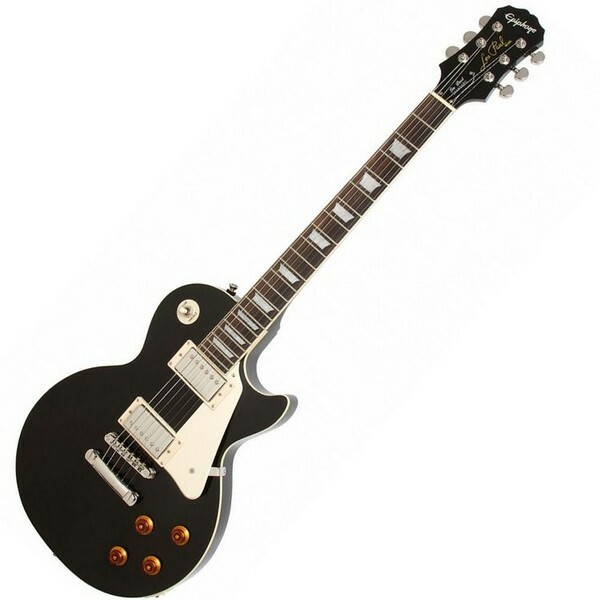 The idea worked and this business model has continued with Epiphone guitars acting as a low priced but well made introduction to the more expensive Gibson guitars. Now I have to admit at this point that I am an avid fan of Epiphone. I think they make excellent quality guitars which are great value. You can perhaps tell that I have an Epiphone Les Paul Standard so please forgive the bias. So what does the Epiphone Les Paul Standard have to offer? The Epiphone Les Paul Standard has a solid mahogany body topped with maple. The Epiphone Les Paul Standard has a body that is hand crafted from solid mahogany with a maple top. 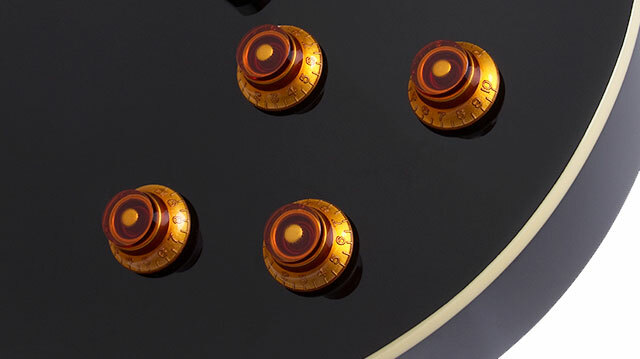 This design helps to deliver the classic resonant sustain that we have all come to expect from the Les Paul. The neck is made from mahogany and is topped with a rosewood fretboard. The headstock is made with a 14 degree back angle that provides more pressure at the nut giving better tuning stability and improves the sustain of the sound. The neck is finished with trapezoid inlays and 22 medium jumbo frets. The whole design and build of the Epiphone Les Paul Standard is aimed at creating that famous rich Les Paul sound, in this it succeeds. Individual tone and volume controls for each pick-up gives great tonal control. In terms of electrics the Epiphone Les Paul Standard come armed with a pair of Alnico Classic™ humbucker pickups. 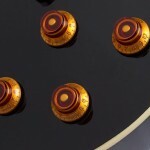 These pick-ups deliver the warm, rich tone recognised as the Les Paul Sound. Epiphone are justifiably proud of their pick-ups. When winding the humbuckers, Epiphone utilizes a double vacuum waxing process that ensures a quiet operation free from microphonic hum. In the manufacturing process the pickup is first placed in a specialized wax vacuuming system before the cover is placed on the unit to ensure that the wax fully penetrates to the very centre of the pickup and solidifies all parts. After the cover is fitted in place, the pickup is given a second vacuum wax bath until the unit is completely saturated. Epiphone uses only the highest quality parts for their pickups including ABS plastic bobbins, 1010 Cold Rolled Steel pole shoes and pole screws, Alnico magnets and the finest magnet wire available. This all combines to give a great sounding humbucker which you would expect to find in a guitar at a far higher price point. In terms of the control the pick-ups can be accessed through the 3 way pick-up selector and there are separate volume and tone controls for each pick-up. This gives you great control of the sound that comes from the guitar. 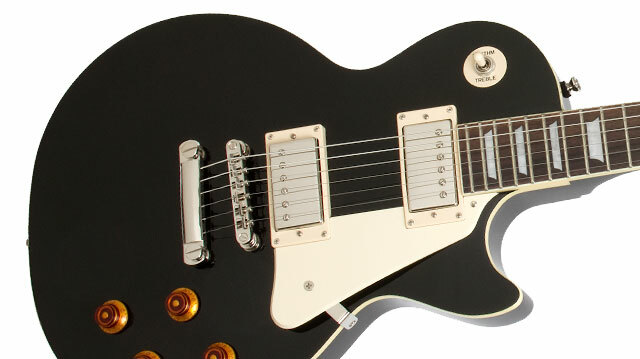 The Epiphone Les Paul Standard is fitted with a Tune-o-matic stopbar fully adjustable bridge. 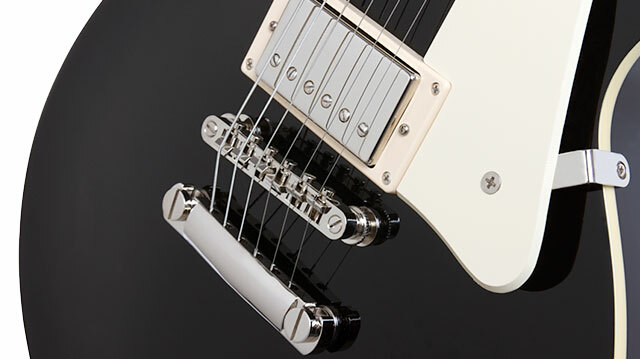 This is the classic Les Paul bridge but it has been up-dated and up-graded patent pending design which auto-locks the bridge and tailpiece in place with no tools needed. 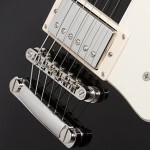 Epiphine claim that this new bridge also helps to improve the sustain of the guitar. The machine heads are Grover tuners for stability and long life. 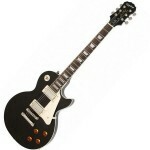 What does the Epiphone Les Paul Standard play and sound like. As you would expect from a Les Paul the guitar is solidly constructed and so you really know that you have a quality guitar hanging round your neck. If you are used to a light weight super-strat style guitar you will certainly notice the difference in the weight. However, all this weight gives rise to the great resonance and sustain so is well worth it. Plug the Epiphone Les Paul Standard into an amp and it is clear why this is the guitar of choice for so many guitarists. It is a versatile guitar producing a great sound whether played clean or distorted. You can get deep down and dirty or punchy and twangy which makes this guitar comfortable no matter what your musical taste. Rock, blues, Country, Jazz or Metal this guitar will not disappoint.